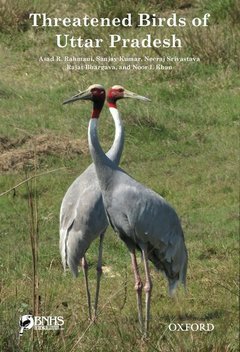 Threatened Birds of Uttar Pradesh Rahmani Asad R., Kumar Sanjay, Srivasrav Neeraj, Bhargava Rajat, Khan Noor I.
Auteurs : Rahmani Asad R., Kumar Sanjay, Srivasrav Neeraj, Bhargava Rajat, Khan Noor I. This book is the fourth in the series of statewise volumes on threatened birds of India, and is largely derived from Threatened Birds of India (2012) by Dr. Asad R. Rahmani, published by BNHS/OUP. Information has been updated according to the latest IUCN 2013 Red List for Birds, incorporating the changes in threat status recommended by BirdLife International, UK. The book describes the threatened and near threatened avian species of the state of Uttar Pradesh, with notes on their distribution, ecology, historical records and current distribution. Based on this updated information, appropriate recommendations have been made regarding the conservation action that needs to be taken for each species. The Introduction has been supplemented with short notes on extinct birds of Uttar Pradesh as well as threatened birds likely to be found in the state. Detailed descriptions are given for the species for which Uttar Pradesh holds critical habitats. Shorter descriptions are given for species marginal to the state. The book is intended to be a handy reference for interested readers, as well as decision makers at the state level, where conservation actions are implemented.